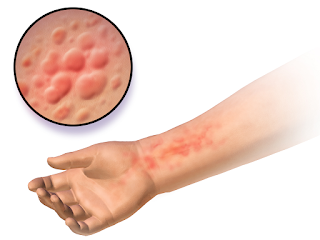 Urticaria/Hives are itchy, red skin rashes that are triggered by an allergen. An allergen has a capacity to develop an allergic reaction on skin. This condition is also known as weals, welts, or nettle rash. 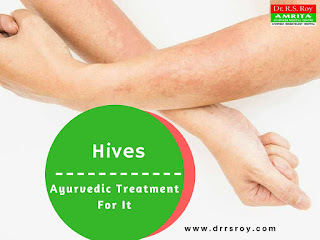 Ayurveda has effective treatments for Urticaria/Hives. A benefit of proper consultation and treatment facility can be achieved by visiting Amrita Ayurveda Medical Centre, Tripunithura. How Urticaria/Hives occurred on the skin? Generally, an allergic reaction is occurred when our body releases a protein, histamine. Capillary blood vessels leaks fluid when an allergen attacked on the skin and body release histamine. Later that fluid accumulates in the skin and causes rash. This condition is not contagious but needed proper care. Many times, people did not recognize the exact cause of the hives. The condition is not life threatening but can survive from minutes to months to several years. How Ayurveda is helpful in Urticaria/Hives treatment? Ayurvedic treatment is highly effective in Urticaria/Hives. Ayurvedic treatments are consisting of body purification methods to remove toxin substances with the use of herbal remedies and their preparations. Intake of digestive herbs restores the digestive fire and use of oils can nourish and tone the skin and body. Ayurvedic Panchkarma therapies such as abhyanga, svedana, virechen, and vaman are used to relax the body and for curing Urticaria/Hives. Ayurvedic treatment also encourage to follow a strict diet encourages to use honey, mustard oil, split leguems and pomegranate and avoid sweet, sour, and heavy products. Amrita Ayurveda Medical Centre, Tripunithura has provided best Ayurveda facilities for chronic urticaria treatment in India to cure urticarial/hives in the natural environment. A person feels rejuvenate and fresh while taking treatment in the center. The center has the best dermatologist in India with experienced and friendly staff.